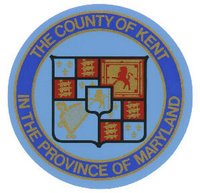 The official flag of Kent County, Maryland has the Great Seal of Kent County on a blue field. Above the Seal, in white, is the word KENT, and below the Seal, in white is the word COUNTY. The county was founded in 1642 and that date, in white, appears on the flag and below the word COUNTY.